Update: The deadline for this program has passed. Read about who applied and what the organizers have learned from this pilot. News about the global economic climate for science funding has not been encouraging for post-doctoral scholars looking for a research position. As negotiations take place over the European Union budget, due to be resolved in 2013, Campaign for Science and Engineering (CaSE) puts an estimated €80 billion ($102 billion or £63 billion) in research funding at stake. Spain’s secretary of state for research development and innovation, Carmen Vela, revealed in the June issue of Nature.com that the grants and subsidies used for research have been reduced by 25 percent (€475 million, £380 million, or $591 million). And in the US, the focus on the presidential election has left many unanswered questions about the future of funding. But the economy isn't the only challenge early career researchers face. The temporary nature of research positions means that most postdocs are perpetually between jobs. To compound the difficulty: when projects end for any reason, usually so do the benefits that come with them — such as having access to published work. For post-doctoral researchers, this access can be a lifeline for staying competitive and connected to the research community. In this year's Annual Postdoc Survey, current and former postdoc fellows from the US, Europe and Asia ranked "Advancement Opportunities/Career Options" as the number one indicator of success for them and "Networking" as number three, both up from previous years. Conducted by Science Careers, a resource of the American Association for the Advancement of Science (AAAS), the survey polled 3,280 respondents on their postdoctoral experience. Tellingly, the number of former postdocs categorizing themselves as unemployed also increased — from 2 percent in 2010 to 10 percent in 2012. Postdoctoral researchers who have received their PhD within in the past 10 years. At least one recent postdoc position which was completed in the past three months or that will be completed within three months. A letter of recommendation from the postdoc's supervisor or institution verifying employment. 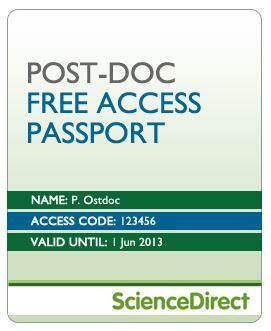 This alarming trend is the driving force behind a new initiative by Elsevier: the Postdoc Free Access Passport. 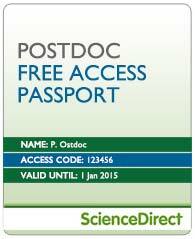 The program, which is open for applications until December 15, provides unlimited access to books and journals on ScienceDirect for up to six months to young scholars who do not have a research position. The program's mission is to help postdocs stay abreast of new science and maintain their interest in advancing their field as the markets improve. "This is a great opportunity for (postdocs) to keep in touch with the latest news in their field of interest and to identify the most active centers of research where they can apply for a position," said Dr. Lenka Stockova, a research assistant from the Czech Republic. According to Dr. Stockova, access to published research is "not only important, it is really necessary. Otherwise you cannot keep up with the latest research in your branch of study." Diddel Francissen, Executive Publisher for the Tetrahedron chemistry journals, explains how the program was conceived: “We always discuss the position of and changes for postdocs in our publications at the Tetrahedron board meetings. We realized that with the current market developments, we should pay extra attention to how postdocs are being affected." Editors and publishers at a recent meeting began to share stories about postdocs in countries where funding has been hit hardest, acknowledging that many emphasized the mounting pressure to stay competitive and publish, in many cases without the resources to do so. "Postdocs face a challenging time as big pharma has closed down many operations in Europe and the US, university budgets are squeezed and research budgets are reduced,” said Dr. Stephen Neidle, Professor of Chemical Biology at University College London and Editor-in-Chief of Bioorganic & Medicinal Chemistry, who was part of the team that devised the initiative. 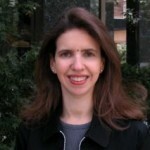 As Director of Project Management for STM Journals Marketing at Elsevier, Inez van Korlaar @InezvKorlaar) is responsible for global marketing projects for the STM Journals department, which includes outreach to researchers in their role as an author. She is based in Amsterdam. I think this is a really brilliant idea. However, it is not helpful for me since my postdoc ended a little more than one year ago. When this happened I decided to take the opportunity to have some time off to raise my very young children. Now that they are nearing school age I am working toward getting back into science. A program like this could be very helpful to me, if the 3 month time limit were relaxed a bit- Or if a similar program were devised to help young mothers/fathers ease back into science (or just stay current in their field). I find that my colleagues are individually very helpful, but it would be nice if institutions were equally accommodating. I think that institutions that do these kinds of things to help retain women in science will gain a competitive edge because they would be providing a valuable resource to people who have fewer options. I agree with Lora. This is an excellent idea, apart from the 3 month limit! I took 6 months off after my last postdoc for personal reasons. I am now employed again, but not in my field, and would like to start writing fellowship applications to return to research. Not having access to the literature, however, makes this very difficult! I think a limit of 12 or so months would be more appropriate. At present we indeed have restricted applications to postdocs who have lost their jobs in the last 3 months or will become unemployed within the next 3 months. The reason for the limitation is that we want to make sure we grant access to people who are serious about pursuing a career in academia. However, comments such as yours and others we have received made us realize there are many exceptions. The program is currently in a pilot phase and we will be evaluating its success soon. Based on our findings we will take a decision about the future of the program and possibly changing the application criteria based on the feedback we have received. So I would like to thank you for your comments, which are of great value in shaping our program to suit the needs of young researchers. I must say that you forgot Ph.D. students that recently finished their Ph.D. who are facing the same situation as postdocs between 2 positions. They are even facing a harder situation since they did not have yet the experience of a first postdoc and their profile is not advanced as that of a scientist with a postdoc experience. Dear Nizar. You are right we did not include PhD students this time. The reason for the limitation is that we wanted to make sure we grant access to people who are serious about pursuing a career in academia. However, we have just finished the pilot and will be considering repeating the program next year, and possibly include PhD students that time. Thanks for taking the time to comment. 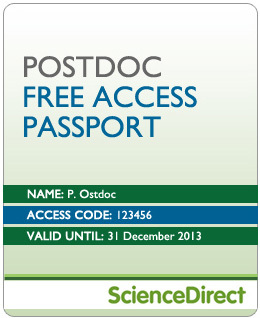 Who applied for the Post-doc Free Access Passport?